¿Recuerdas tu graduación de preparatoria? Yo la recuerdo perfectamente. Si me transporto en el tiempo 25 años atrás, en ese entonces jamás me hubiera imaginado el curso que tomó mi vida y que me trajo al punto en donde estoy hoy, que superó por mucho las expectativas que tenía para mí misma en esos momentos. Sin embargo, algo que sí tenía muy claro en esa fiesta en la que apenas se empezaba a escribir mi vida adulta era que estaba a punto de irme a vivir a Europa a aprender un tercer idioma, que iría a la universidad, que estudiaría, que me convertiría en una profesionista, trabajaría, me casaría y tendría hijos. Sí, lo quería todo, y pensaba que, en efecto, era capaz de todo. Para muchas jóvenes éste no es el caso. Muchas dejan sus estudios truncos mucho antes de llegar siquiera a la preparatoria, muchas se embarazan y se ven aún adolescentes con la responsabilidad de otra vida en sus brazos, y muchas que se llegan a graduar con muchos esfuerzos, no tienen claro si podrán costearse sus estudios universitarios, mucho menos conseguir un trabajo que les permita tener una familia y seguir desarrollándose profesionalmente. Por eso, cuando me invitaron a presenciar la iniciativa Say Yes to the Prom, en la que participan 50 jóvenes de las escuelas Edison High School, Southridge High School y el Mexican American Council, de Miami, me pudo mucho no poder asistir, pero les prometí que escribiría sobre su significativo evento en este espacio. Estas chicas se reunieron en el Hotel Biltmore de Coral Gables para hacer realidad el sueño de la noche de graduación. Las niñas, destacadas en sus estudios, pero que debido a la situación económica de sus familias no podían asistir a la fiesta de graduación, tuvieron un día de moda y belleza donde pudieron escoger su vestido de entre 2,500 opciones, zapatos, bolso, accesorios, y recibieron servicio completo de maquillaje y peluquería. 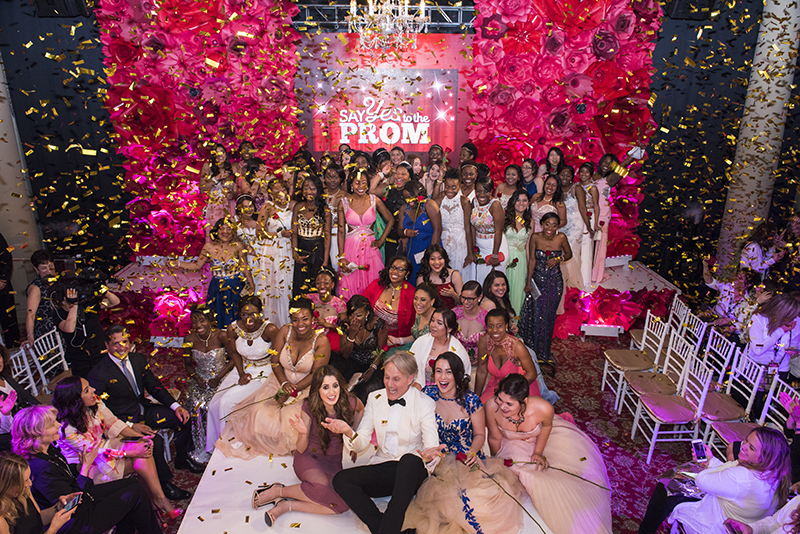 Además del vestido y accesorios para el prom, las estudiantes estuvieron acompañadas por mentores y personalidades, como la congresista Ileana Ros-Lehtinen; Alberto Carvalho, superintendente de Miami Dade County Public School; Monte Durham, asesor de moda y protagonista de la serie de TLC, Say yes to the dress; así como Laura Marano, cantante, actriz y estrella de la serie Austin & Ally de Disney Channel. Pero no sólo eso, Lenore Rodicio, decana del Miami Dade College, anunció durante el evento que todas las estudiantes que califiquen recibirán una beca para sus estudios en esta institución a través del American Dream Scholarship. Las jóvenes también recibieron una laptop, cortesía de Discovery Communications. Más allá de lo que significa tener un vestido y una fiesta de graduación, para mí lo valioso de esta iniciativa es darles a estas jóvenes que apenas inician su vida adulta el mensaje de que con esfuerzo y dedicación todo se puede. Estoy segura que este evento será uno de los cimientos de la seguridad en sí mismas que irá construyendo cada una de esas jóvenes durante su vida adulta. Do you remember your high school prom? I do. Perfectly. If I go back in time 25 years a go, back then I would have never imagined the path my life took and that brought me to the place where I am now, and that surpassed by far all the expectations that I had for myself in those moments. Though, if something I had clear in that party in which I was starting my adult life, it was that I was just about to go abroad to Europe for a year to learn a third language, that I was going to college, that I would study and become a professional woman, that I was going to work, that I was going to marry and have children… Yes, I wanted all, and I thought, that indeed, I was capable of all. For many young women, this is not the case. Many quit their education, even before starting high school, many get pregnant when they are still teenagers, and many that graduate with a lot of effort don’t have clear if they are going to be able to pay their college, even less if they are going to have a job that will allow them to have a family and keep their professional growth. That’s why when I was invited to the initiative Say Yes to the Prom, in which 50 young women from Edison High School and Southridge High School participate, along with the Mexican American Council of Miami,and I couldn’t assist I promised to share in this space such a wonderful event. This girls got together in the Biltmore Hotel in Coral Gables to make their prom night dream true. The girls, all of them outstanding in their studies, but with an economic situation in which they could not afford to go to the party, had a whole day of fashion and beauty, in which they could choose their dress, shoes, clutch, accessories, and also had a complete hair and makeup session. Congresswoman Ileana Ros-Lehtinen; Alberto Carvalho, Miami Dade County Public School superintendent ; Monte Durham, from the TLC series Say yes to the dress; and Laura Marano, singer and actress from Disney Channel series Austin & Ally were also present. Leonore Rodicio, Miami Dade College provost, announced during the event that all the students with the qualifications would receive a scolarship to study in this institution through American Dream Scholarship. These young ladies also received a laptop from Discovery Communications. So more that having a dress and a prom, for me the most valuable aspect of this initiative was to give these young women that just start their adult life the message that with effort and dedication you can do anything you want. I am sure that this event will be one of the foundations of the self-confidence that each of this women will build through their lives.